17 year old Megan (Rainbow Harvest) and her mother (Karen Black) move into a new house, 3 months after Megan’s father has passed away. Megan takes a liking to an old mirror that has been left in her room, so they buy it. One night Megan wishes, while looking at her mirror, that her father would come back, that night she has a dream about him. Soon she comes to realise that asking for things in her mirror has a tendency to make those wishes come true, and she uses this newlyfound power to become more popular and to take revenge on the people who victimised her and her only friend at school (Kristin Dattilo). Mirror Mirror is one of many thousands of films that I can understand getting lost. It’s a teen horror movie from the wilderness years between the boom of the 80s and the genre’s mid 90’s revival. A low budget and lack of big names - at least beyond Karen Black and the always welcome William Sanderson - probably didn’t help its position among a raft of other choices on video rental shelves. Rainbow Harvest. That’s her real name, and that’s almost as much as I know about her. She has only 11 credits and 3 feature films to her name and I’ve only seen one of the others, her debut, the wonderful Old Enough, a great teen movie from 1984 that we’ll definitely get to in this series. Since making a TV movie called Pink Lightning in 1991 she has, in effect, dropped off the face of the planet. It’s fair to say that’s a pity, because Harvest definitely had something about her. As Megan, Rainbow Harvest definitely fits the mould of the high school outsider. With her jet black hair, blonde undercut, heavy black eyeliner and especially individual taste in hats, Harvest is an arresting sight, but beyond the look you buy Megan as a shy girl who both craves to have more friends and uses her outsider status to push them away and protect herself. 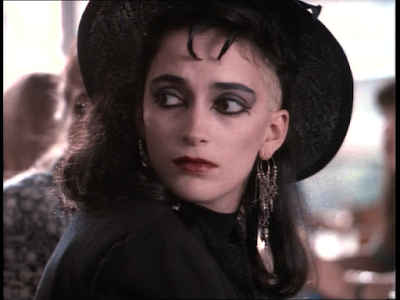 The look shifts during the film - from Bettlejuice Winona to Heathers Winona - but Harvest is always an intriguing presence. The film itself draws influence from the likes of the Amityville series (I’m sure there’s one about a haunted lamp. Hell, there’s probably one about a haunted mirror) in its high school sequences it looks to Heathers as well as Carrie (which gets a nod in the dialogue) and, to some degree, anticipates The Craft. The bullying that Megan goes through is fairly standard stuff, and few of the characters, even Megan herself, develop that much depth, but as the mirror’s powers become clear Harvest is great when Megan, rather than be shocked or frightened by what she can now do, instead embraces it and uses it to enact a brutal revenge on popular girl Charlene (Charlie Spradling) for what are ultimately rather small slights against Nikki (Kristin Dattilo), the only girl who has even tried to be Megan’s friend. This and other sequences involving the mirror (especially one where Megan uses it to make sure that if she can’t have the popular guy in school, nobody can), are solidly shot by director Marina Sargenti and reasonably scary, particularly as Megan's powers become more extreme, slipping out of her control. The film also scores points for hitting on a genuinely haunting ending. There is fun to be had with a supporting cast full of cult names. Karen Black is restrained, but good value, as Megan’s mother and William Sanderson, even in a benign role as Black’s new suitor, still has a creepy vibe to him that underlines Megan’s discomfort with her mother dating again so soon after her father’s passing. There are also small parts for Stephen 'Ned Ryerson' Tobolowsky and Lily Munster herself, Yvonne DeCarlo. Like her star, director Marina Sargenti did little work after this film, though her immediate follow up, a TV movie called Child of Darkness, Child of Light, sounds interesting. She hasn't directed since an episode of Xena, 20 years ago. To my surprise, there is a UK DVD. It’s a poor quality transfer from Hollywood DVD, but at least it’s out there. It’s 22p on Amazon UK. In the US the news is even better: both Mirror Mirror and Old Enough are available on Amazon Video for free streaming.